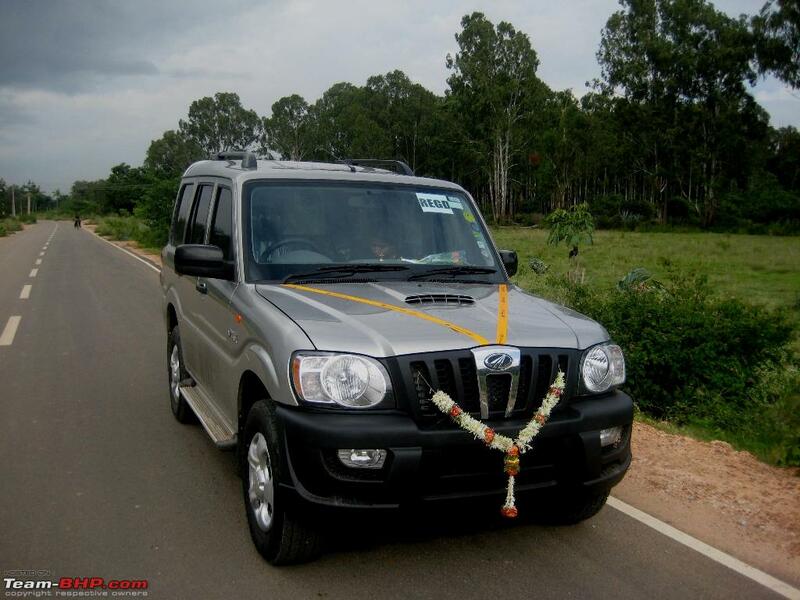 Bringing home the Mahindra Scorpio LX. EDIT : Scorpio finds a new home! Just like the case when i had set out to buy my Ikon, i knew exactly which vehicle it was that i wanted when i was looking to upgrade. That in itself ruled out any specific car hunting tasks. It was only a matter of taking a couple of test drives, arranging for the finances, and then proceeding with the booking. 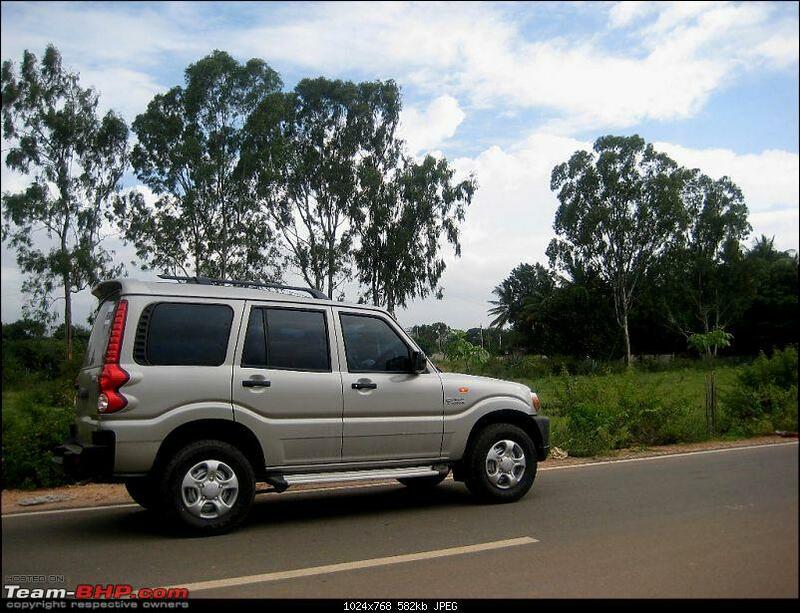 We went ahead and booked a Mahindra Scorpio LX in Mist Silver. We wanted a diesel SUV and one with almost as much features as our faithful steed Ikon offered. Except for the fog lamps, the Scorpio LX was a direct match. 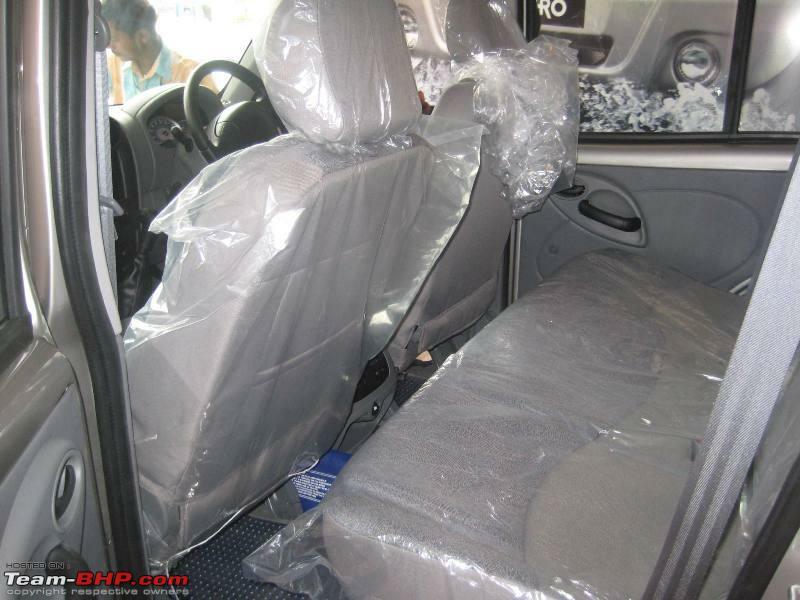 Also, as the vehicle was to be bought on a lease policy from the company, i had an upper limit to keep within. Therein was the decision process, all so simple and clear! The only question which kept on bogging us was whether to buy it now, or wait till later, as our ikon was still in the prime of its health. The biggest factor FOR was the price of petrol, and the amount of daily running these days. Over the period of time i was tracking the price of the LX, it had already increased by Rs. 50,000 on the ex-showroom price. Also, we always wanted an SUV which we could take off the beaten track without complaining. Last edited by benbsb29 : 29th July 2011 at 17:10. Excellent driveability both in city and on highway. Lesser number of storage places inside compared to the SLE variant. Glovebox lid requries a bang to shut it. Feels awful on a brand new vehicle. Illogical placement of power window switches. Gearshift from neutral to first is hard during cold starts. Poor illumination from the headlights + fog lamps. Full marks to Sireesh Auto for the delivery experience. They did everything they could to make it memorable. We were gifted with flowers and photo of the occasion was clicked and framed on the spot. In addition, they also put up our pics on their Facebook page, and mailed us the link. The sales representative i dealt with was Balachandra who was very prompt in getting back with whatever information i had requested. I was a bit pushy regarding the delivery timelines of the vehicle and he constantly updated me with news of its progress. There was a delay in the initial delivery times, where i was asked to wait for almost a month and a half, but a note to the Mahindra customer care, and i was promised an early allotment, which they adhered to. I was also in contact with Rajith from TBHP who helped in whatever ways he could, as well as Spike Arrestor on the forum who patiently answered my various queries from time to time. When the vehicle arrived at the dealer's stockyard, it had 17kms on the odo, where I did the PDI, with a quick reference to the TBHP checklist. It was not love at first sight, as it was sans wheelcaps, and also had the wheels covered with muck, owing to the slush near the yard. 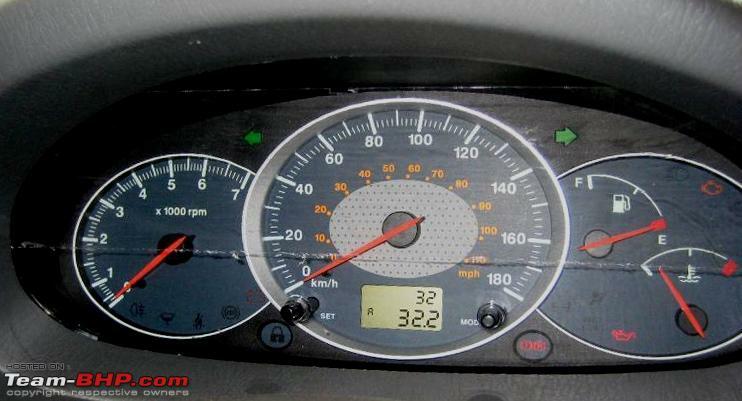 When i took delivery, it had done 32 kms, regarding which i had no complaints. It was now my turn to keep the odo ticking. Last edited by benbsb29 : 29th July 2011 at 18:24. WHOA, how did i miss this? Congratulations Ben, am glued to your ownership. 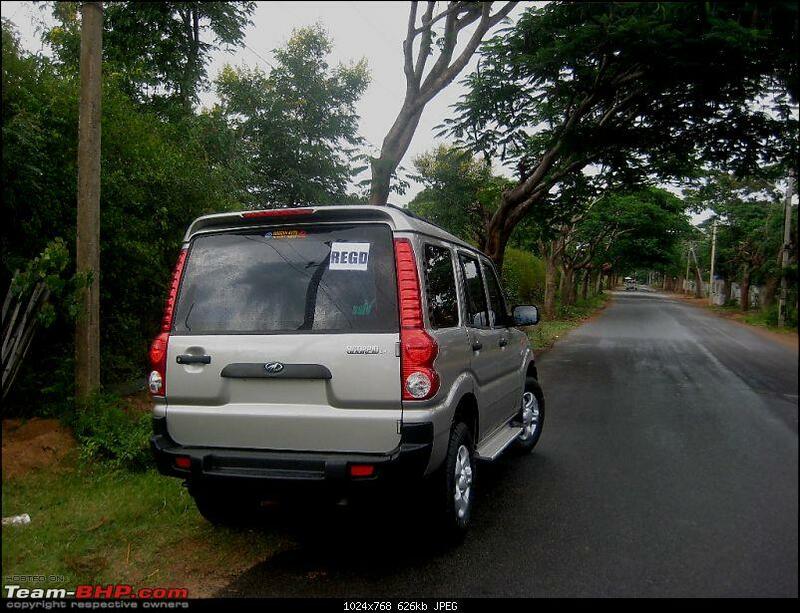 As you know my Ikon has also completed wonderful 6 years so am also thinking on the lines of either changing or getting a 2nd car and using this as a 2nd car (for the wife primarily). Do give your views on the handling and price. Would love to read how you feel with the Scorpio after spending so many wonderful years with Mike. Wish you a wonderful ownership bro. Last edited by sammyboy : 29th July 2011 at 18:37. Congrats once again Benny, the Scorpio pictures are really shot in nice locations. I look forward to happy updates to this thread, happy motoring. It rained cats n dogs the day we took delivery. Rather than feel bad about it, we enjoyed it to the max! Went about splashing through puddles (without inconveniencing other road users), and also took it through narrow roads where it commanded respect. The feeling of sitting high up, watching the rest of the world was priceless. 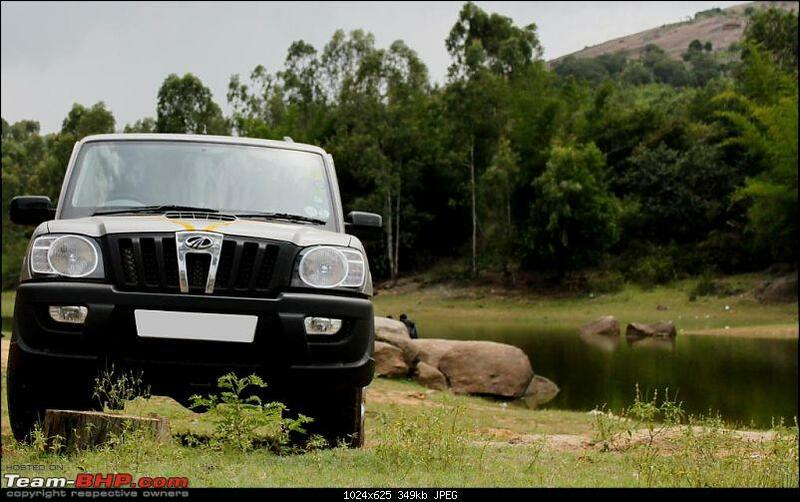 Thanks to my friend Vijay (Scorpio_fan), whose Scorpio i had driven on a number of occasions in the past, i felt right at home when i climbed into the driver's seat. 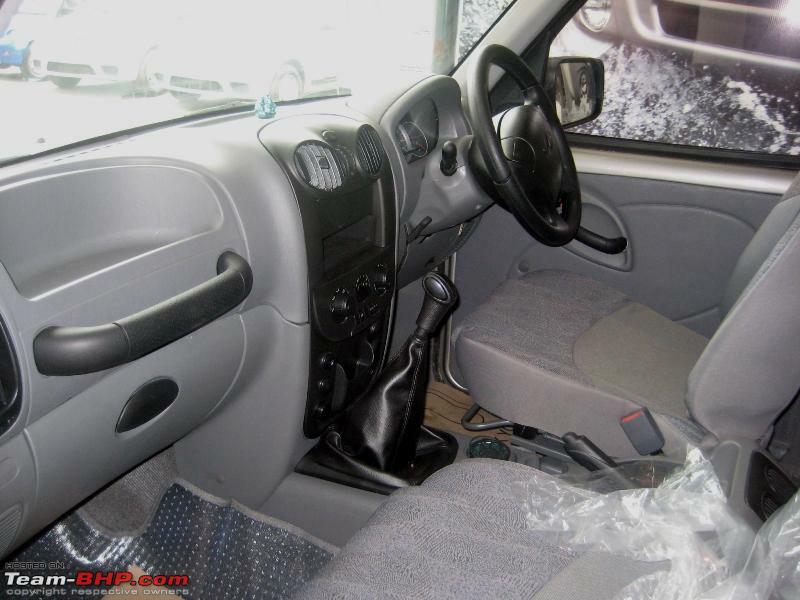 Visibility was excellent for a vehicle of such dimensions, and the controls too were within reach, save for the pitiable placement of the power window switches. Every time i had to use them, i had to take my eyes off the road. While i have gotten the hang of them now, i still dislike their placement. On the LX variant, there is no option of reverse sensors, however i have managed well without them. Reversing is far easier on the Scorpio than my Ikon as i can make out where exactly the vehicle ends by just looking out the rear window. This is unlike the case of my Ikon where one has to put up with a raised parcel shelf, and can only assume where the boot ends. I really miss the door pockets which came on my Ikon, as i used to store a whole lot of stuff in there. On the Scorpio LX, this too is absent, and i am now considering getting a door pocket made to hold knick-knacks. Since the manual mentioned to take it easy for the first 5000 kms, i haven't been pushing it much. Briefly took it to 110 kmph on the NH4 highway during our trip to Tumkur. 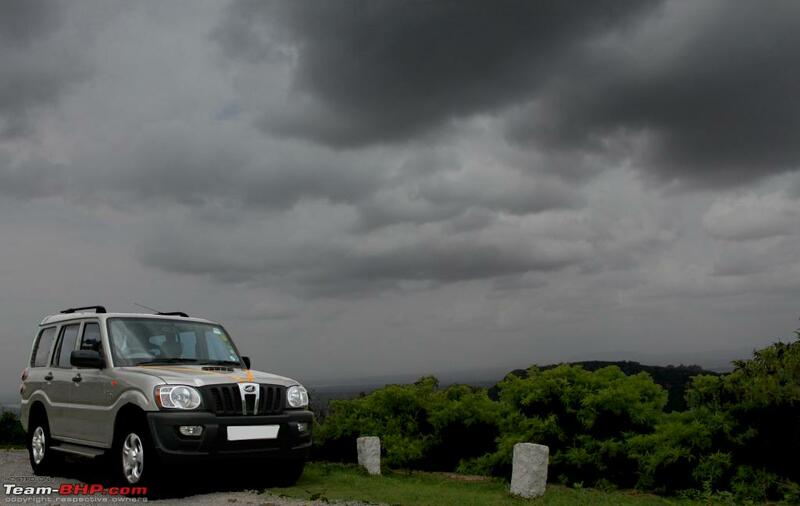 The vehicle has managed to cover about 1000 kms within the first 10 days since we took delivery. The engine has now freed up since the time i took delivery, and feels more smoother now. The whole ownership experience so far was not without its share of quirks. 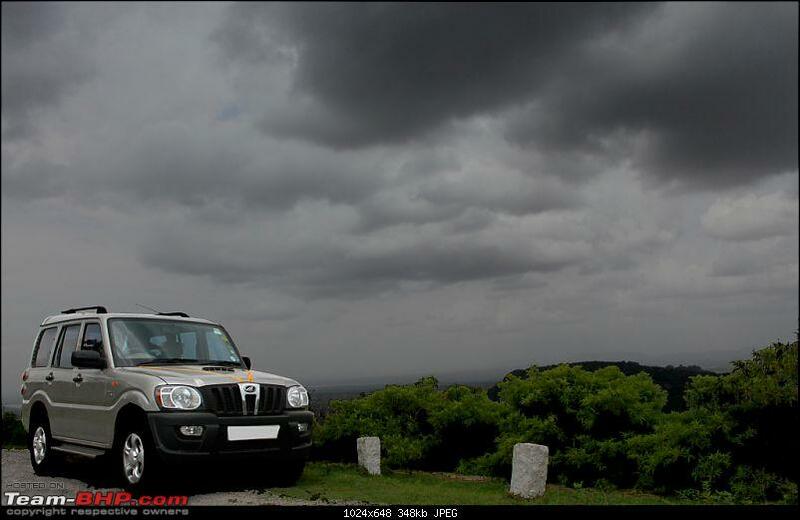 On the day we were to go to Tumkur, i started the vehicle, and the battery low indicator stayed lit. I turned off the engine (ala Ctrl + Alt + Del style) and restarted, but it was still there. I decided to take my chance and see if it would go off once it started charging. I disengaged the handbrake, and just as the vehicle started moving, the battery low indicator went off, not to come back again. Self-healing, surely. I'm still getting used to the idling after parking part, thanks to the graduation from a petrol vehicle. Although the manual mentioned idling after a highway run, keeping in mind what others on the forum have mentioned, i am following the practice for any run. Fuel efficiency has been pretty much on par with what other fellow users have reported. The first tankful returned about 10.12 kmpl, which was mostly city driving. 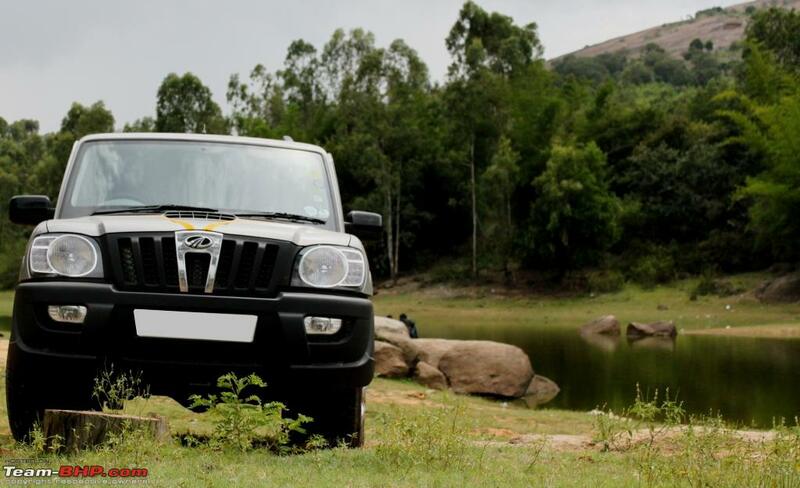 The second tankful returned 13.3 kmpl, which included a bit of highway driving, as well as a lot of city and hill driving, including a bit of off-roading at Tumkur. More as the kms pile on. One suggestion reg the lighting: Aux lights better than upgrading the stock ones. * This will give you an extra pair of lights, so even if any one bulb conks out, you will have 3 more. * You can go a step further by upgrading the aus lamps instead. * This will keep your stock at OE specs, and this can be used in the city limits. * Looking at the possible running on the highways you would have, I will re-iterate the need for aux lamps. * You can take the aux lamps off at any time (if required). I am also looking for a set of Hella's, and am planning to upgrade the Hella's from 55W to 90W. Just one other thing: how about de-chroming the grille ? Might look simpler, but not so garish as it is right now. And, welcome to the club ! Last edited by condor : 29th July 2011 at 20:05. 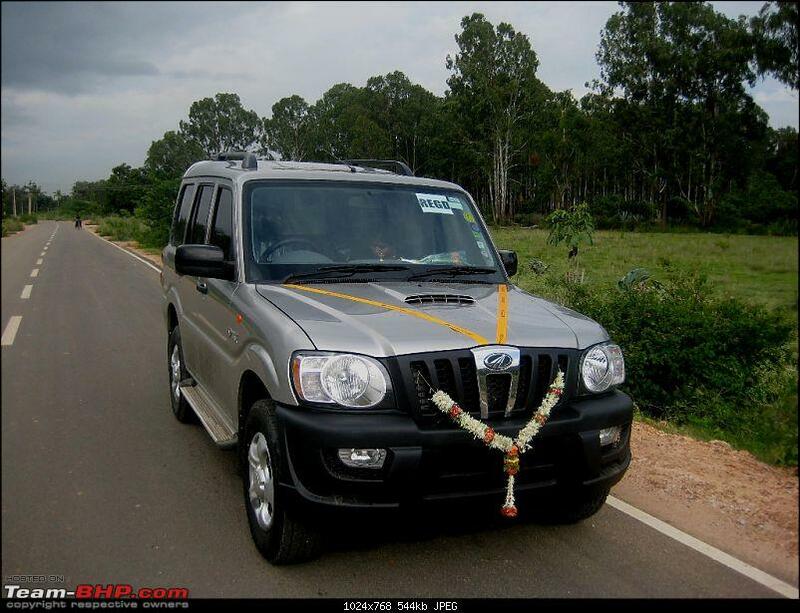 Congratulations buddy for your Mahinda Scorpio LX. Very nicely compiled thread with great pictures, rating five stars. Wishing you happy and safe driving. Congrats!! Wishing you many miles of happy driving. Congrats and wishing you lots and lots of miles. The pics make the Scorpio look very nice indeed. Almost tempting me to consider an upgrade. Welcome to the family of hawks. Congrats... To me this is (and not the SLE) the most sensible Scorpio model. Now if only, M&M could come up with some optional extras for this like ABS and the 4WD, and this would have been perfect. Looking forward to more, as you crunch more miles. Benny - pls blacken the B & C pillars. It will give a much better look in a very cost-effective way. And you can DIY it. 1. Have you opted for the extended warranty? If not, please do so. 2. How much did the wheel caps and fog lamp fitment cost you? 1. Don't shut the glovebox with a bang. Take the lid near the closing position and then close it firmly with a short & swift motion. Same goes for the rear hatch door. 2. During a cold start, pump the clutch [depress fully!] a couple of times before engaging the gears. Then, go thru the entire range once [1-2-3-4-5-R], before you again put it in 1st and move off. This sounds tedious, but won't take even a minute. I know it doesn't make sense, but I've been following this routine from day 1 and my gear shifts have been always pretty smooth and snag free [touchwood!]. 3. 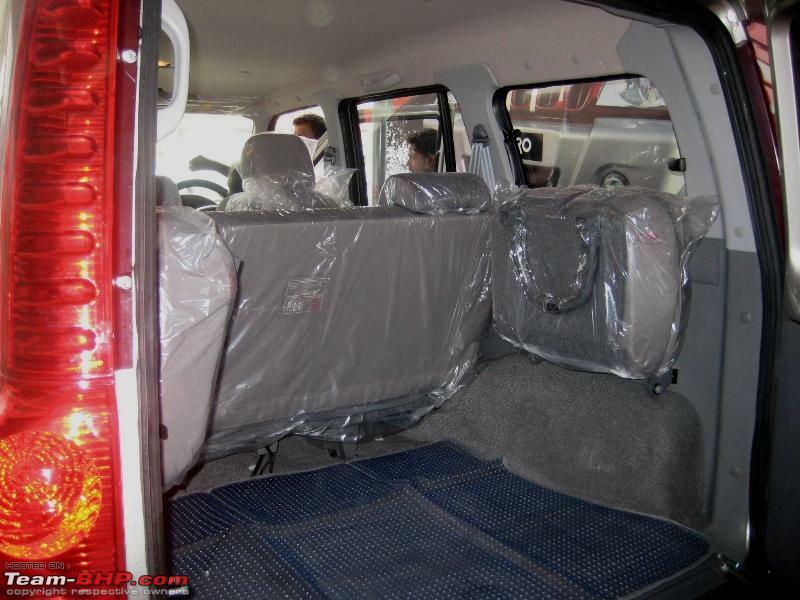 Even if your middle row isn't occupied a lot of the time, do open & close the rear power windows once in a while; else the mechanism operates really slowly. 4. Every door has a small cylindrical rubber stopper [with threads] at the bottom corner. These have a tendency to come loose and fall off. If that happens, there's a possibility of your door setting going out of kilter. So, keep an eye on them, specially after a pressure wash & interior cleaning ritual. It's really hard to get them at the ASCs! 5. As you've mentioned, do follow the idling routine religiously. 6. Get your AC filter cleaned at every service. It's a 2 minute job, but contributes immensely to the effectiveness of the AC. 7. Please keep your Scorp as stock as possible! 8. After the 1st oil change at 5k kms, M&M recommends 2nd oil change at 20k kms and then subsequent oil changes at 40k, 60k kms etc. IMO, a 20k kms oil change interval is a bit too much for congested cities like B'lore/Pune. So, after the 1st oil change at 5k kms, my suggestion would be to stick to a 10k kms oil change interval regimen [i.e. oil changes at 5k, 15k, 25k kms etc]. It's a little bit heavy on the pocket, but totally worth it. Use Delvac MX if you like; your Scorp will love you for it. Wish you a million miles of safe and happy ownership! P.S: I envy you so much for getting the grey/black interior combo in your Scorp. I hate the beige interiors in my SLE! Last edited by comfortablynumb : 29th July 2011 at 22:14. Comgrats on your new purchase. This colour looks good on Scorpio. Wish you many happy and safe miles. 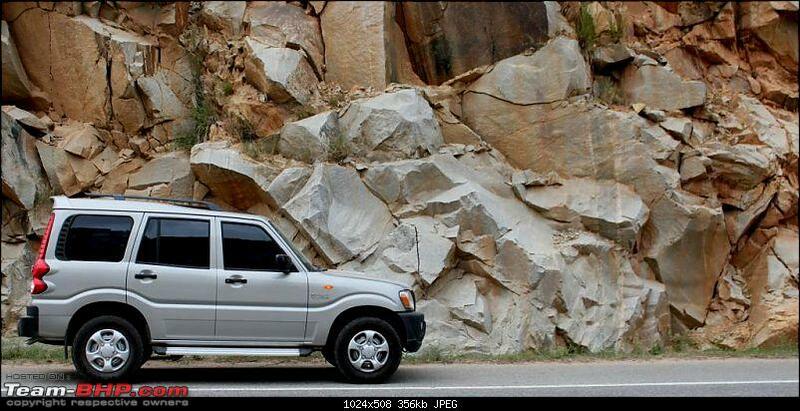 Scorpio is my dream vehicle. 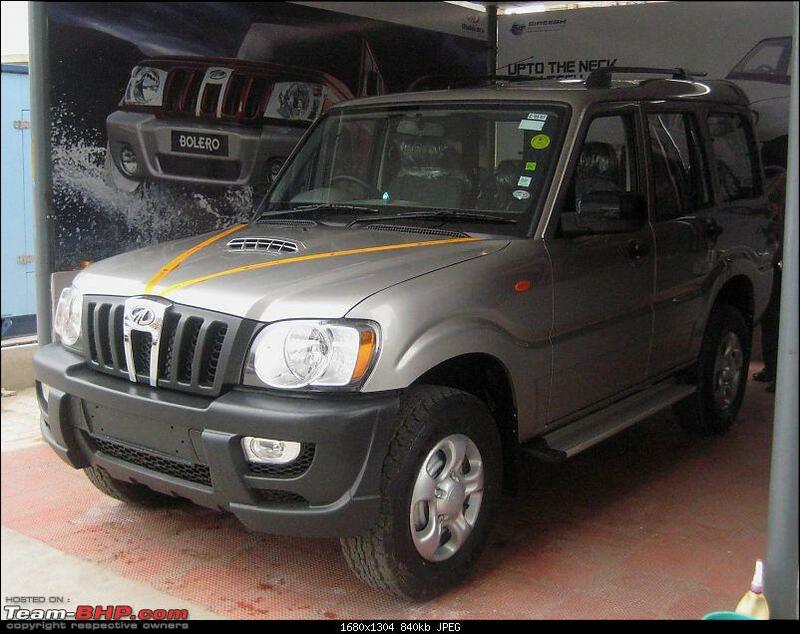 Mahindra should have atleast provided door pockets in Scorpio LX. Hope that you will keep this thread updated.